Re: Show us your new knife! 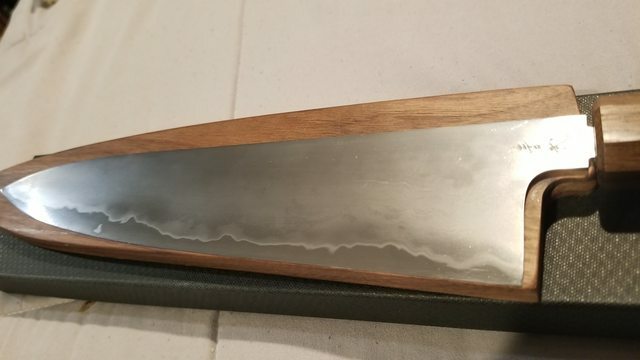 Let me be the first to post the new Konosuke white FT. Looks awesome, like it got hit by lighting!!! At first I thought you made a mistake about your FT being White vs Blue 2 steel, but I see what looks like a light Ho wood handle from another retailer. Beautiful knife, congrats! Does anyone understand why there are differences in Kanji and what they mean? I think the small B2 Kanji there is Mr Kawamura's hand engraving. The main B2 Kanji is on the other side of the blade. The W2 seems to have the main Kanji on the opposite side from the B2 FT.
Love to know that too. My 240 W#1 has the hand engraved kanji both sides. Quite different to the latest batch of 270 W#1 that shipped same time which has the traditional stamped kanji on the left side. The new FM240 grind looks like the FT which in turn follows the HD2 profile. No more wide bevels. 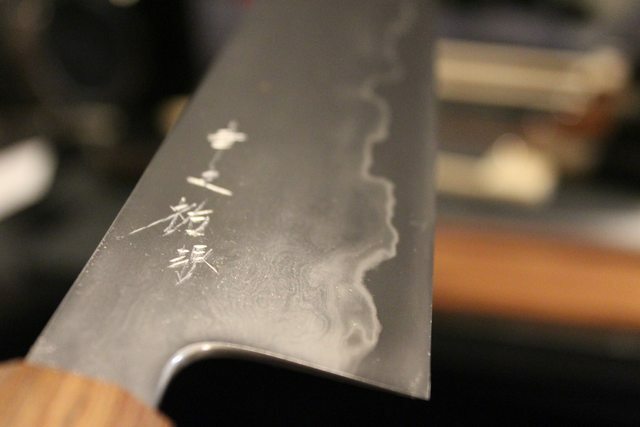 I don't know if it is a rule of thumb, but I have noticed that in most of the knives there is stamped kanjis on the left side and on the right side of the blade there is chiseled kanjis. In the case of new FM it has chiseled kanjis on both sides. The kanji on the right says Konosuke. I'm most curious about the 2 kanji on the left. Seems to id the core steel. BoostedGT, I like your White FT. Looks very exotic!!! Any major difference in the blue or white? 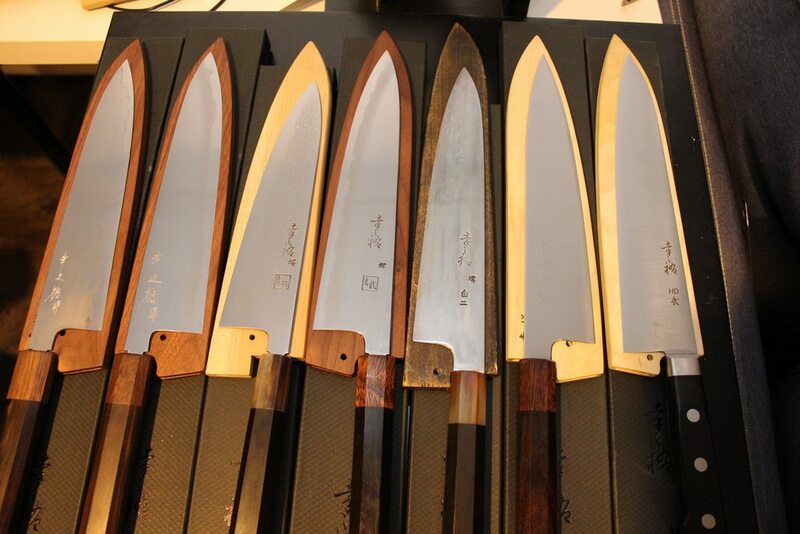 A shot of the Konosuke family with the different kanji. I think you can only get the hand kanji from CKTG. My 210 Fujiyama is hand kanji on both side. 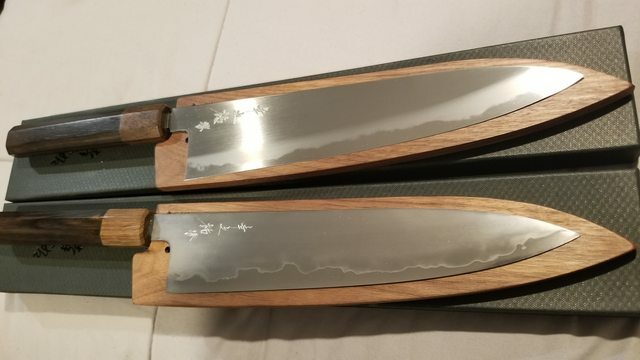 Tosho Knife Arts is also getting some chiseled kanji versions. ...Yes we’re getting all of the Fuji blades with Mr. Kawamura’s engraving work going forward. I understood the comment as CKTG will be receiving hand engraved versions going forward and no more stamped ones. I do not believe he was talking about other retailers. That’s a very nice family shot Coquus. Very impressive! I noticed how thin the W1 is as well. My W1 FM 270 is overall a lot thinner than my B2 FM 240. We all know that Tosho HAD some but they may become exclusive to CKTG. The insinuation was that they might be exclusive GOING FORWARD. But as mentioned, Mark may have just been speaking of his orders and not that of all Fujis, we'll see. The grind on the new W#1 is something else. Only my TF Denka 210 is thinner. 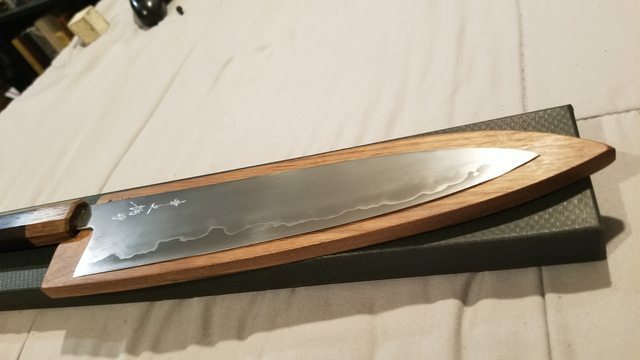 Did you guys get a Saya included with your knives? My reading was that Mark would only be getting chiseled blades going forward. But not necessarily as an exclusive to CKTG.